In addition to rollaway incidents, children are also particularly susceptible to injury caused by power windows. 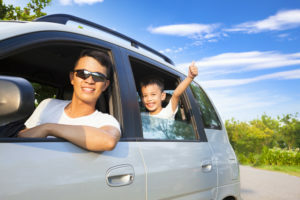 A common type of power window injury happens when a child has his or her head out the window of a parked car and unintentionally presses the window switch. The glass moves up forcefully, suffocating the child. These types of injuries can be reduced by using safer window switches. Rocker and toggle switches are fundamentally more hazardous than levers, especially if they are installed horizontally on the armrest of the door. Rocker switches move the glass up when you push one side of the switch and down when you push the other side. Toggle switches work when pushed forward or pulled back. Either of these can involuntarily raise the window when a child steps or leans on them. The third type of window switch, the lever switch, must be pulled up to move the glass up; thus, it is safer because it makes it difficult to raise the window accidentally. 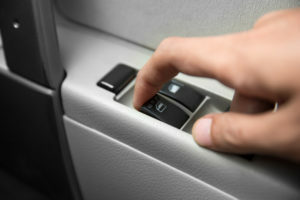 It is also less dangerous to install power window switches vertically or on an upswept armrest because they are tougher to activate inadvertently. The National Highway Traffic Safety Administration banned power window rocker and toggle switches from U.S. passenger vehicles manufactured after October 1, 2010, but millions of vehicles with insecure power window switches remain on the road.